The Angel Lace Scarf is simple and easy to crochet! The finished shape is triangular. The best thing is that the scarf can be worn in many different ways, even as a shawl! You can always ask me for help if you need it while crocheting your scarf. You will be supporting Crochet Spot by purchasing this pattern or by becoming a Premium Pattern Member. Thanks in advance for all of your support! This entry was posted on Saturday, January 30th, 2010 at 12:26 AM by Rachel Choi	and is filed under Best Crochet Patterns. You can follow any responses to this entry through the RSS 2.0 feed. You can leave a response, or trackback from your own site. It is 9 degrees here today, and I am soooo looking forward to spring. I have made a gazillion hats, scarves, etc., and am working on an afghan right now. Though I love making cozy winter stuff, I am really in the mood for something light and springtime-ish. This gorgeous scarf is just what I was looking for. And I think I’ll use the same bright pink color. Love it! Thanks for all the great patterns, Rachel! 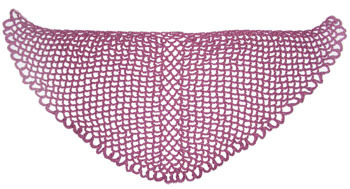 Hi, just purchased your angel lace scarf pattern. Hi Kathy, I used Caron Simply Soft Yarn for the scarf. thanks will have to go see who sells it. my daughter and I were in san diego this past month, went to a farmers market/arts sale. a lady was selling a scarves like this one, only she had tied on hundreds of peices of ribbons on one, another had feathery yarns, another scraps of material. they were unbeliveable beautiful. but she wanted $140. for them. needless to say we didn’t buy one. going to try and make one. Just made this scarf for my grand daughters. Only I crocheted 300 mini pony beads on it. They love them. still trying to figure out one I saw in san diego. it was just like this with scraps of material and ribbons tied on it. It was beautiful. this scarf is so easy and fun to make, thanks. Is it okay to crochet this scarf with 100% acrylic yarn? Yes, Cherine. In fact the yarn in the photo is 100% acrylic. I just bought this pattern and cannot seem to get started. I’m sure once I get past the first few rows it will be simple, but I just keep rereading the instructions for rows 2 and 3. Any help would be appreciated! Ahh, I was totally over-thinking it! Thanks! Hello! I don’t have a drawing at the moment, but if you can let me know which part you’re stuck on I can try and explain it to you in more detail. The Angel Lace Scarf pattern cannot be found?! 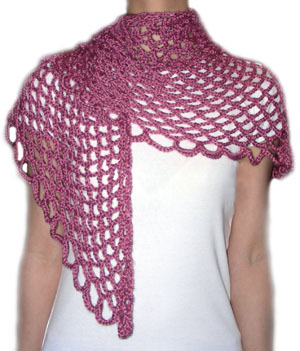 Have you done a youtube video for the Angel Lace Scarf? I am having difficulty visualizing the start of the pattern- especially row 2 sc into the loop 2 times? I learn very well with videos and visual instructions. Sorry, I don’t have a video. For row 2, you will chain 6. Then make a single crochet into the loop. Then you will chain 6 again, then make another single crochet into the same loop. The “loop” is the circle that you made on row 1. Let me know if you need more help with it! Thank you for the quick reply Rachel! I sorted it out by carefully following the sc in space instructions listed elsewhere on this site. Up to row 11 now and it’s going well! I am using a dk weight yarn and 5.5 mm hook and will be interested to see how it comes out. This yarn is smaller in size than the Caron you mentioned using above. That’s awesome, Kim! I’m so glad you were able to sort it out. I’d love to know how it turns out. Have fun with it! I was wondering if you could use a light weight yarn for this pattern? Hello! Yes, you can use a light weight yarn. You may want to adjust the hook size to obtain the proper gauge, or add more rows if the size ends up being smaller.